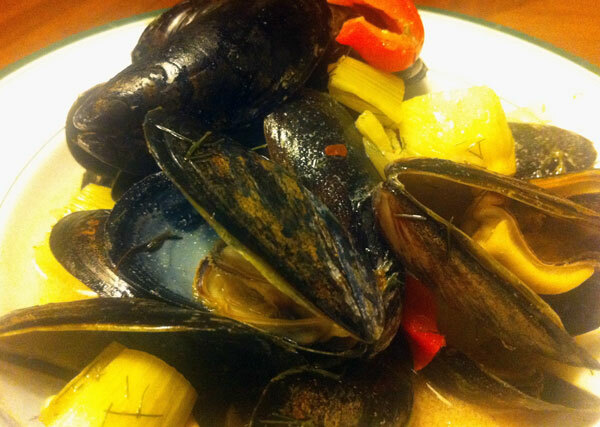 Mussels cook really fast, making them a quick-and-easy dinner, but they don’t keep well. Ideally, you should buy them as soon as possible before cooking—on the way home from work is perfect, but they can survive in the fridge for 24 hours or so if necessary. The directions in most mussel recipes say the creatures need to be “scrubbed and debearded,” which I’ll admit sounds a bit off-putting. But in reality, most seafood markets pre-clean their mussels and there’s very little you have to do. Just look through yours, discarding any that aren’t tightly closed, washing off any visible dirt or sand, and pulling off any stringy “beard” bits sticking out of the shells. To cook mussels, you just need a little liquid (something alcoholic, like beer or wine, is traditional), a little acid (wine or lemon juice), and some veggies. As the mussels cook, they open up and release their briny liquid, creating a tasty broth that’s addictive soaked up with bread. If you’re using beer, try to avoid anything too hoppy, as the mussels will acquire hops’ bitter flavor. A malty, dark Belgian or brown ale is your best bet—I used Sierra Nevada Tumbler Brown Ale in this recipe, and it was perfectly lovely. One more note: Mussels don’t keep as leftovers. Eat them all when you make them or throw them out. Cut 2-3 inches off of fennel fronds, chop finely, and set aside. Remove remaining fronds and discard. Slice root ends off fennel bulbs and chop. Heat a couple tablespoons of olive oil in a stockpot over medium heat and add chopped fennel bulb, onion, and pepper. Season to taste with salt and pepper, add red pepper flakes, and cook until softened but not browned, about 5 minutes. Add garlic and reserved fennel frond, and cook 30 seconds. Add lemon juice and beer, and bring to a boil. Add mussels, cover, and reduce heat to low. Cook 5 to 10 minutes or until mussels have opened. Taste broth and add salt if necessary. Jason, this sounds delicious. I’ll have to try it soon. You can ask Jason’s dad about eating day old mussels!